Eyewitness Bloody Sunday – The Truth (Wolfhound Press, Dublin 1997; Robert Rinehard Publishers, USA 1997; Merlin Publishing, 3rd edition, 2002) was Mullan’s first investigative book which became a bestseller in Ireland and has been described as ‘politically influential’. It is officially credited as a major catalyst in the establishment of the longest running and most expensive public inquiry in British legal history – The Bloody Sunday (Saville) Inquiry. Don Mullan was a schoolboy witness to the tragic events of Bloody Sunday and vividly recalls the shooting dead of Michael Kelly. Eyewitness Bloody Sunday was based on 100 of 700 eyewitness accounts of the Bloody Sunday massacre, including his own. The book was produced in collaboration with the Bloody Sunday families and wounded and the Bloody Sunday Justice Campaign. Mullan has always stated that his work built on the work of others before him and that the main credit for the historic achievements of the Campaign was the Bloody Sunday families and wounded. 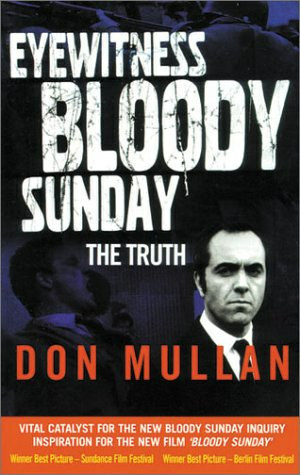 The book created a sensation when Don Mullan offered a plausible hypothesis that three of the Bloody Sunday dead were shot by a British Army sniper firing from the vicinity of the Derry Walls. A strong supporter of his hypothesis was Dr Raymond McClean, a local GP and former SDLP Mayor of Derry who initially set out to disprove Mullan’s theory but eventually concurred. Dr McClean had attended a number of post-mortems of the Bloody Sunday dead and had noted that the three whom Don Mullan suspected had been shot by a sniper, had almost identical 45% downward trajectory wounds. After careful investigation, Mullan’s theory was seized upon by Britain’s Channel Four News who produced their first of a series of Bloody Sunday specials based on his hypothesis. The book was headlined in The New York Time World News section on the 30 January 1997, the 25th anniversary of the massacre, which recorded: “The atmosphere has been roiled in recent days by the province-wide debate on the new book [by] Mr. Mullan…”. Prior to the publication of Mullan’s book, Bloody Sunday was seen by the Irish establishment as having been hijacked by Sinn Fein and violent Republicanism and was, therefore, kept at arm length. However, Mullan’s humanitarian and human rights background created a space for the Irish Government to engage. Mullan was contacted by officials at the Department of Foreign Affairs and the Department of An Taoiseach shortly after the publication of his book in January 1997 and for two years, in the lead-up to the new Bloody Sunday Inquiry, he was the conduit between the Irish Government and the Bloody Sunday families and wounded. During that period he played a key role in organising a number of visits to Dublin, Belfast and London, to meet British Secretary’s of State for Northern Ireland, Sir Patrick Mayhew and Mo Mowlan; Irish President Mary Robinson; and the first meeting ever between an Irish Taoiseach and the Bloody Sunday families and wounded. A major outcome of the meeting with An Taoiseach John Bruton was the announcement that he would instruct Civil Servants to critically evaluate all of the new evidence coming forward, including Mullan’s theory of three victims having been shot from the vicinity of the Derry walls. Mullan was entrusted by the Irish Government to read the penultimate draft of its dossier ‘Bloody Sunday and the Report of the Widgery Tribunal – The Irish Government’s Assessment of the New Material’. For two days in June 1997, he was given a room within the Department of Foreign Affairs and given privileged access to the highly sensitive dossier. His comments and observations were incorporated into the final draft which was presented to the new Labour Government of Prime Minister Tony Blair MP, in June 1997. The impact of Irish Government’s Report increased momentum towards persuading the British Government to establish a new Inquiry. On the 30th January 1998, the 26th anniversary of Bloody Sunday, little more than a year after the publication of Eyewitness Bloody Sunday, the British Prime Minister, Tony Blair, announced the setting up of a new Bloody Sunday Inquiry. On 3 April 1998, the new Bloody Sunday Inquiry opened at the Guildhall in Derry. It became the longest running and most expensive Public Inquiry in British Legal History. The most remarkable and unexpected outcome was the statement made by the British Prime Minister, David Cameron, who, in accepting the findings of the Saville Report, described the brutal events of Bloody Sunday as ‘unjustified and unjustifiable’ before making an historic apology on behalf of the British Government. It was a moment of healing in the festering wound of British Colonialism in Ireland.